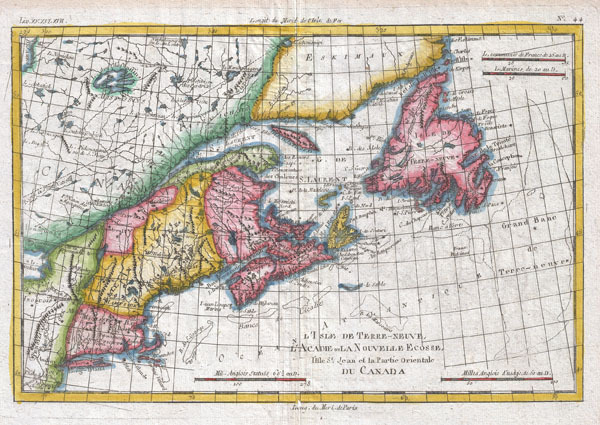 A fine example of Rigobert Bonne and Guilleme Raynal's 1780 map of the Northeast United States and Eastern Canada. This highly detailed map covers the eastern coast of the United States from a portion of New Jersey and New York in the south as far north as the Canadian Maritime Provinces of Nova Scotia, New Brunswick, and Newfoundland. Identifies Martha's Vineyard and Nantucket Island. Shows all principal harbors, ports, bays and islands. Along the coast, shoals such as the Grand Banks and the fisheries off Cape Cod are depicted, as this area was extremely important to the North American cod fishing industry through the 18th century. Drawn by R. Bonne for G. Raynal's Atlas de Toutes les Parties Connues du Globe Terrestre, Dressé pour l'Histoire Philosophique et Politique des Établissemens et du Commerce des Européens dans les Deux Indes.